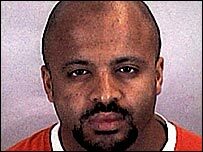 Al-Qaeda plotter Zacarias Moussaoui has been jailed for life over his involvement in 11 September attacks on the US but the early roots of his radicalism lie in the seven years he spent in London. The last time Abd-Samad Moussaoui saw his brother was when he took him to catch a flight from Montpellier to England in 1993. Zacarias Moussaoui was frustrated in France. He felt that his Moroccan Muslim origins were preventing him from achieving his ambitions; he would often complain to his brother that he was the victim of racial discrimination. The 24-year-old was also seeking adventure and thought cosmopolitan London was the place to get it. No-one could have predicted that this desire for thrills would lead him to become embroiled in international terrorism - perhaps it was this restless nature which made him easy prey for the extremist preachers he would later encounter. These London-based foreign clerics would transform Moussaoui from a young man who loved life to someone who wanted to become a suicide bomber. His only aim when he first arrived in the UK was to improve his English and further his education. He enrolled at South Bank University where he studied for an MA in International Business Studies. He also began to attend Brixton Mosque in south London, living there too - he was homeless and the mosque allowed its worshippers to sleep there and use its canteen facilities. Moussaoui's interest in religion was also awakened, and he began regularly praying at the mosque, reading the Koran and attending theological lectures. Abdul Haq Baker was the mosque's chairman and became Moussaoui's friend and confidant. Mr Baker remembers Moussaoui as an affable individual with a sense of humour which attracted him to others, but also an admirable seriousness about his faith. "He wanted to revive his roots which were in Islam. He wanted to be a good Muslim, a knowledgeable Muslim, who wanted to know how to implement the tenets of Islam and make sense of the society he was living in," said Mr Baker. At the mosque Moussaoui would normally be accompanied by his childhood friend Xavier Jaffo. Both men would take the road to radicalism that would lead them to aspire to martyrdom. That journey began at a south London leisure centre and Brixton Town Hall where a Muslim cleric called Sheik Abdullah el-Faisal had started to preach sermons that advocated violence and suicide bombings in the name of Islam. 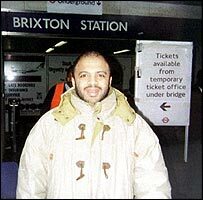 El-Faisal, a Jamaican convert, had been the imam of Brixton Mosque before being expelled by the leadership who were opposed to his jihadist ideology. He recruited young men to his cause and apart from Moussaoui and Xavier there was Richard Reid, the convicted British shoe bomber. Mr Baker is certain that Moussaoui and Reid first met at el-Faisal's talks. In 2003 el-Faisal was jailed for incitement to racial hatred and for calling for the killing of Jews, Americans and Hindus. His message had taken hold with Moussaoui much earlier. Mr Baker noticed changes in Moussaoui 18 months after first meeting him. "He became arrogant and dismissive," says Mr Baker. "He thought we were preaching a watered-down version of Islam and that he was following a pure Islam. "When he came to our mosque he would try and encourage others to come with him to hear el-Faisal." Things came to a head when one day Moussaoui turned up wearing what Mr Baker thought was inappropriate clothing. "He came in wearing military fatigues and a rucksack on his back. I asked why him why he was dressed like that, what the purpose of it was. He basically started shouting abuse. It was an act of defiance but he was very proud of himself." For Baker this was final proof that Moussaoui had turned his back on orthodox Islam and wanted jihad. "He was seeking arenas for jihad. We had conversations about it and he would ask me where the next jihad is and he would become very frustrated when I told him I didn't know. He thought I was withholding information from him." Mr Baker doesn't just blame extremist preachers like el-Faisal for Moussaoui's increasing obsession with war. He also thinks that unless society deals with the genuine problems and oppression facing Muslims then more young men could follow the same path. As Moussaoui was becoming disruptive at the mosque, Mr Baker and his trustees told him that he was no longer welcome. In 1998 he went to the notorious Khalden training camp and started meeting members of al-Qaeda. Moussaoui had also come to the attention of the French security services, the DST, but nothing seems to have been done. Alert to the dangers of being caught, Moussaoui started to develop aliases - also being known as Abu Khaled al Sahrawi and Shaquil. He left Britain and enrolled in an American flight school in February 2001, where he was to learn how to fly planes. Mr Baker thinks his decision to undertake this mission was influenced by the death of his friend Xavier Jaffo. Mr Jaffo had been killed fighting in Chechnya and Mr Baker believes this propelled Moussaoui into wanting to follow in his footsteps and sacrifice his own life.